interpretation On the 6th day of the 6th month of Kaei 6 (1853), this print was approved by the censors, and as mentioned in the Shichū torishimari ruijū it was on sale from the mid of the 6th month onwards. According to the Fujiokaya Nikki, it was first sold on the 18th day of the 7th month. At first glance, this print seems to be a harmless mitate-e for the actors performing at the three famous theaters in Edo. The arrival of Commodore Perry and his squadron of war ships, called the black ships, in Uraga on the 3rd day of the 6th month caused much confusion among Edo townspeople. Although it was strictly forbidden to depict Perry’s arrival, the rumor spread that Kuniyoshi had illustrated the shōgun, members of the bakufu as well as the Americans. The syllable kan concealed in the pattern of the falconer’s (no. 4) left sleeve was interpreted by the Edo public as a reference to Shōgun Ieasada’s nickname Kanshō kubō sama (the epileptic shōgun) indicating the shōgun’s illness of epilepsy. Ukiyo Matabei (no. 1) was identified as Tokugawa Nariaki and the blind (no. 7) as councillor Abe Masahiro. As a consequence, the print gained enormous popularity and it is said that by the 8th month about 1600 prints were printed daily. Abe Masahiro drew attention to the print and ordered an inspection, yet it was difficult to prove anything but the oddness of Kuniyoshi’s print. Nevertheless, the sale was stopped and Kuniyoshi and his publisher were fined. Furthermore, the censorship system was re-examined in the 8th month of the same year. This print differs from an earlier version entitled Toki ni ōtsue kitai no maremono of the same subject which also illustrated disguised actors' portraits. In the former print, the figures have been neatly arranged around the artist, while in this print the figures are moving, dancing and running in various directions showing a diversity of sentiments. The artist Ukiyo Matabei, holding a brush, is starring at the figures. 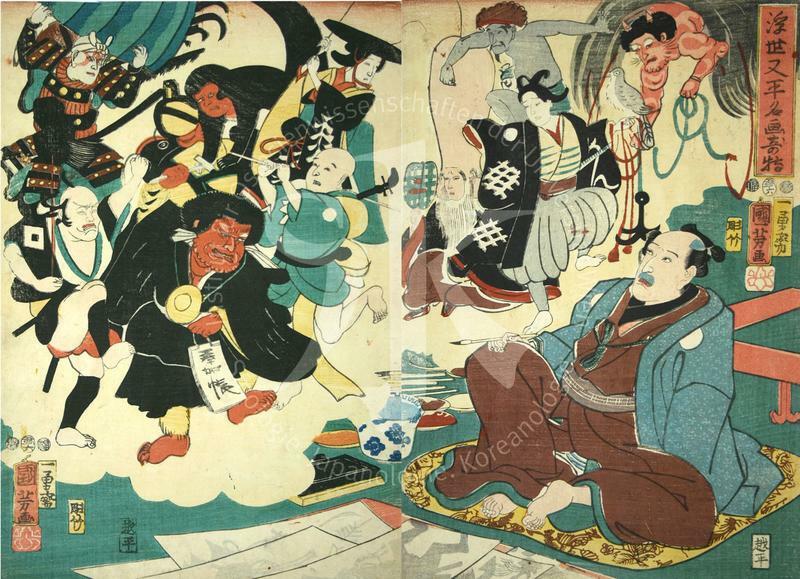 In the upper right is kaminari (the god of thunder) surrounded by a stylized formation of black clouds symbolizing the canons as well as the black ships. The god of thunder is weighing the anchor overtly relating to the arrival of Perry’s fleet. Furthermore, kaminari’s facial features resemble those of a foreigner. The pattern on the falconer’s haori together with the kan-syllable both refer to Shōgun Iesada. The rhombic pattern (kuji bishi), commonly used as a family crest, usually consists of four horizontal and five vertical lines, if designed of double lines the pattern would comprise 18 lines. In this case, only 13 lines appear in the design, which is another hidden reference to the 13th shōgun. This print is a work of political satire commenting on the confusion within the bakufu after the arrival of the Americans. By that time, the mere depiction of actors' portraits, though officially still forbidden, became common practice and would not possibly have served as an attractive subject for an artist like Kuniyoshi. According to Minami, the time span between the arrival of the Americans on the 3rd day of the 6th month and the approval of the censors is too short and therefore a reference to the black ships is not conceivable. Since Kuniyoshi had a strong interest in foreign affairs, it is indeed possible that he could have known about Perry’s visit beforehand, and he might have designed this print in advance of the arrival of the black ships. Furthermore, Kuniyoshi had already worked on a similar subject two years before, which would have saved time in the designing process. It also seems possible that the print found approval by the censors within only three days.